TASTE ANALYSIS: If you smoke Kool, Salem, Newport, Marlboro Menthol, and Other Menthol cigarettes Menthol is for you. $2.66/cartridge - equivalent to paying approx. $1.77/pack on traditional cigarettes. $2.33/cartridge - equivalent to paying approx. $1.55/pack on traditional cigarettes. $2.22/cartridge - equivalent to paying approx. $1.48/pack on traditional cigarettes. Orange Mint electronic cigarettes are a blast of the extraordinary! This is one flavor combo that will give a zing to your senses, and really take you over the top in deliciousness. It’s bold, refreshing and the ideal flavor after a meal. $2.99/cartridge - equivalent to paying approx. $1.99/pack on traditional cigarettes. Tobacco Mint: it’s kind of like menthol, but still totally different. Sometimes tobacco needs a little assistance, and in this case, the mint takes it in a whole new, rejuvenating direction. You need to try Tobacco Mint electronic cigarettes! Are you craving a little something extra in your tobacco? I’m new to this, what do I need? Being new to anything can be exciting, interesting, and fun! Trying out one of your first e-cigarettes is no different. While there’s often a lot to learn, a positive attitude and sincere desire to quit smoking are more than enough to see you through to success. Getting started with our e-cigarettes is simple. Just choose a nicotine level that corresponds to the way you used to smoke, pick a flavor or two that sound delicious, and vape away! The kits at South Beach Smoke are convenient, ready to use, and disposable. No need to worry about messy bottles or batteries, just insert a cartridge and get ready for hours of pleasure while you tackle those pesky cravings. For many smokers, menthol is a pleasant way to mask or accent the flavor of tobacco. Due to the popular demand for menthol and mint flavors, we’ve specially designed a solid lineup of mint and menthol for your vaping pleasure. 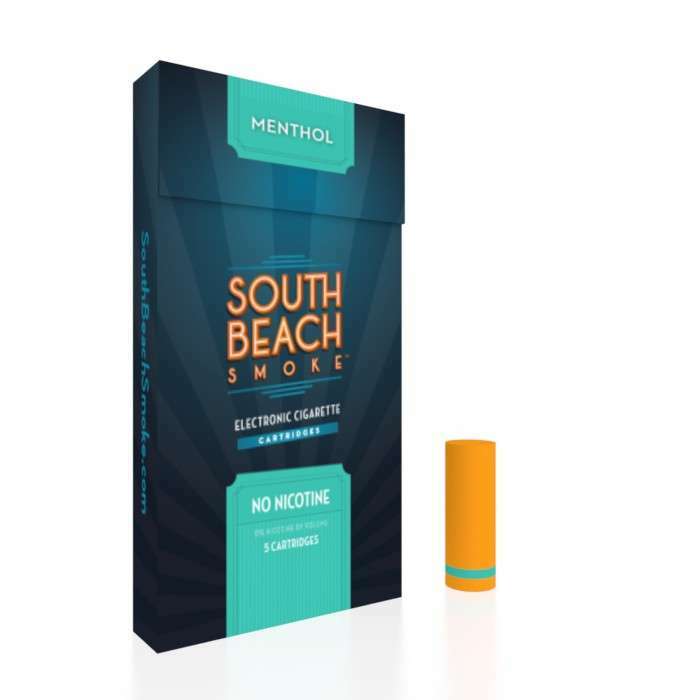 Thanks to our patented Vapor-Flo technology, our menthol e-cig cartridges are more realistic than ever! Our Deluxe Menthol flavor is cool, refreshing, and crisp. Quite similar to the experience of a Kool or a Newport, Deluxe Menthol is a brilliant recreation of a classic flavor you’ve come to rely on. Deluxe Orange Mint is an expertly blended mix that brings the zesty freshness of citrus together with the cool and refreshing notes of mint. Orange Mint pairs well with many other flavors and can be a great way to enjoy the after-meal ritual many have built around smoking. This unique flavor has quickly become one of the most popular we offer, and for good reason! Deluxe Tobacco Menthol is another of our popular choices that appeals to a more refined sense of taste. This elegant and unique tobacco blend is rich, complex, and delicious. And finally, our Deluxe Peppermint flavor is perfect for a blast of cool minty goodness. If you love to add a burst of sweetness to your day, Deluxe Peppermint is the flavor for you! Decadent, creamy, and smooth, this perfect combination of mint is sure to soothe your soul. With so many flavors to choose from, it’s clear why so many people keep coming back to South Beach Smoke for all their vaping needs. By starting with a simple, yet effective device and adding a huge variety of quality flavor cartridges, we’ve been able to grow from a modest start-up to one of the most successful vape companies in history. As a way to say thank you, we’ve added a rewards program that allows you to earn points while saving money. Be sure to enroll today and be on your way to earning rewards on your first purchase!